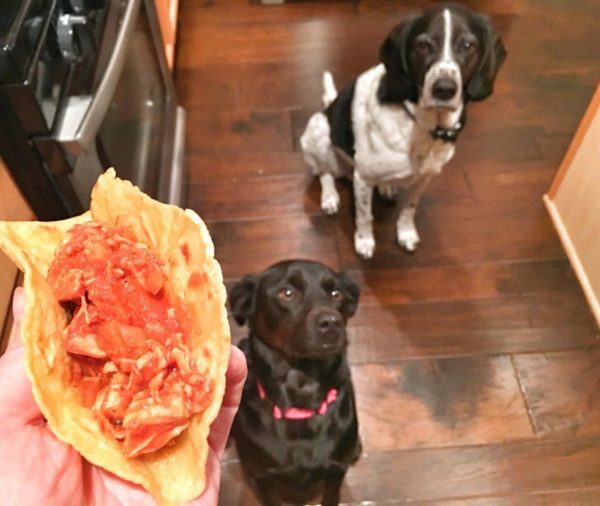 Chicken Tinga Tacos – 80 DO & 21 DF Approved! Tuesdays at my house are for tacos, nachos, enchiladas, quesadillas, etc! We like using different lean proteins, fish or even meatless now and then. 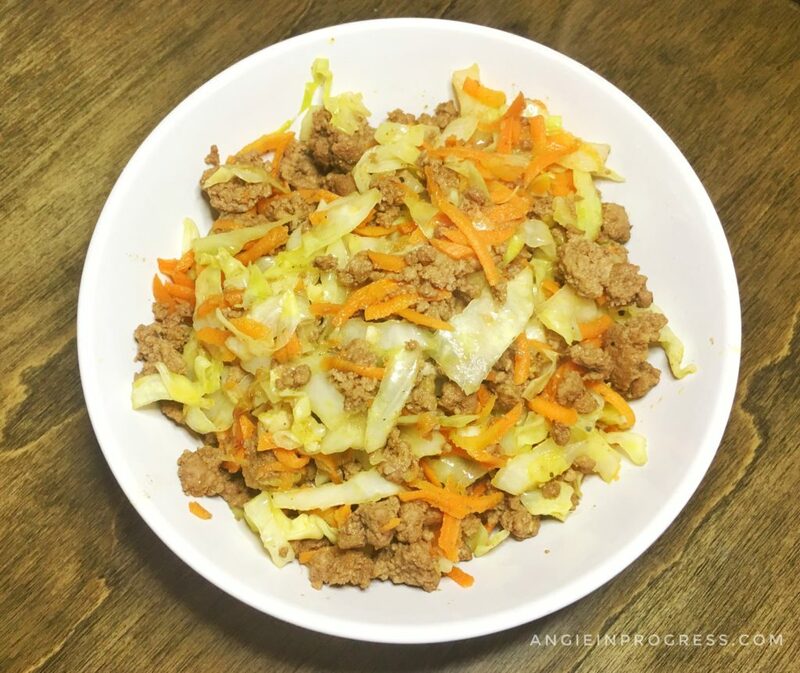 I found this new recipe on Fixate (along with hundreds of workout options, it’s one of the many exclusives for Beachbody on Demand members), and I knew I needed to try it! And good news, it fits in perfectly to my 80 Day Obsession meal plan! The dogs are always very interested in what’s going on in the kitchen. I generally trip over them a few times and finally give in to their desperate stares and actual puppy dog eyes! 😉 They enjoyed a few tastes almost as much as we did! 2 canned chipotle chili peppers in adobo sauce, finely chopped **I used 1 Tbsp. because the first time with two was way too spicy for me! Sprinkle broth with gelatin in a small bowl. Set aside. Heat oil in medium nonstick skillet over medium high heat until fragrant. Add broth mixture, tomato puree, chili powder, oregano, bay leaves, chipotle chili peppers, adobo sauce, lime juice, lime peel, chicken, salt, and pepper. Bring to a boil. Reduce heat to low; gently boil, stirring occasionally, for 15 minutes, or until sauce is reduced by half. Remove bay leaves. Divide ¾ cup (1 red container) chicken mixture between two tortillas (1 yellow) for each serving. 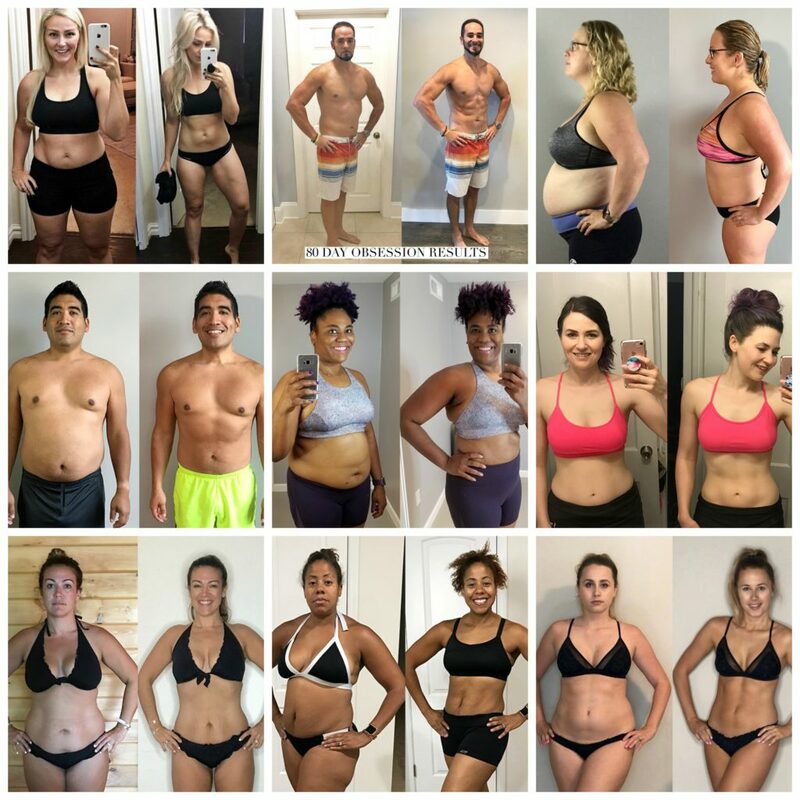 Seven days ago I started this 80 day journey with 51 amazing ladies, all ready to get focused and commit to a new program and our new year goals! And if these first seven days are any indication, the results are going to blow our minds! 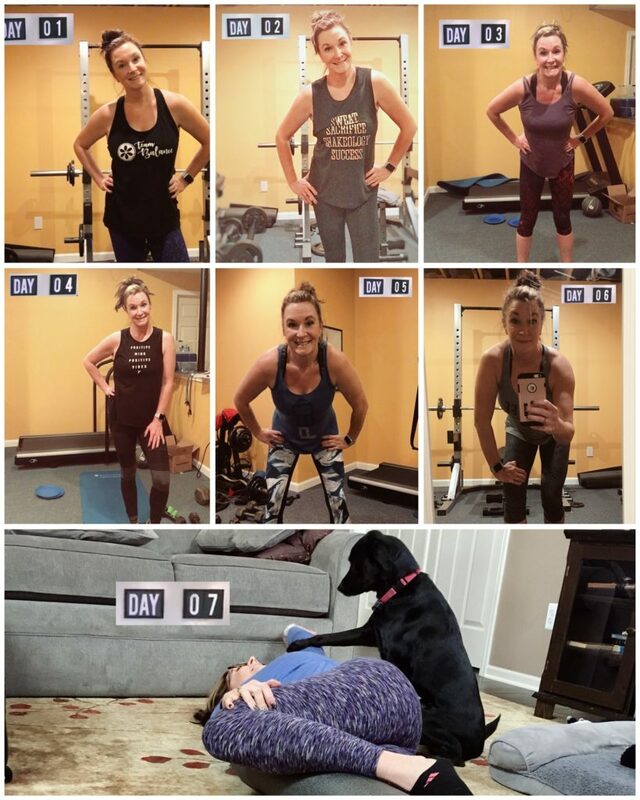 The best way I can describe the workouts is tough but doable – even for a 46 year old mom of four, with a shoulder injury, foot injury and a crazy busy life! These loops and sliders are new and challenging! I love how customizable they are too! I have 6 different options for loop resistance. Whenever necessary, I modified with the sliders too by using a smaller range of motion, or using one leg at a time in some of the exercises. Room for improvement for sure! My first concern was – OMG! This is too much food to eat every day! 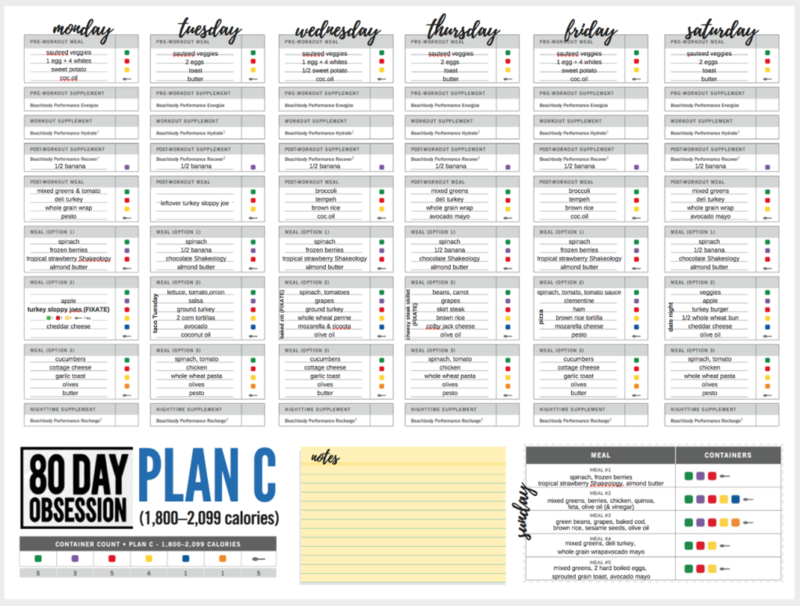 I am in ‘Plan C’ (just in case you were wondering), and I have 5 meals I need to fit in each day. And although there is a learning curve – and planning/prepping is key – it’s ALL laid out for me! I know exactly what types of foods I need to eat at each meal, and at what time throughout the day! Once you understand it, there’s no guess work. I have actually never stuck to a plan as well as I have this one! And doesn’t it all look yummy? 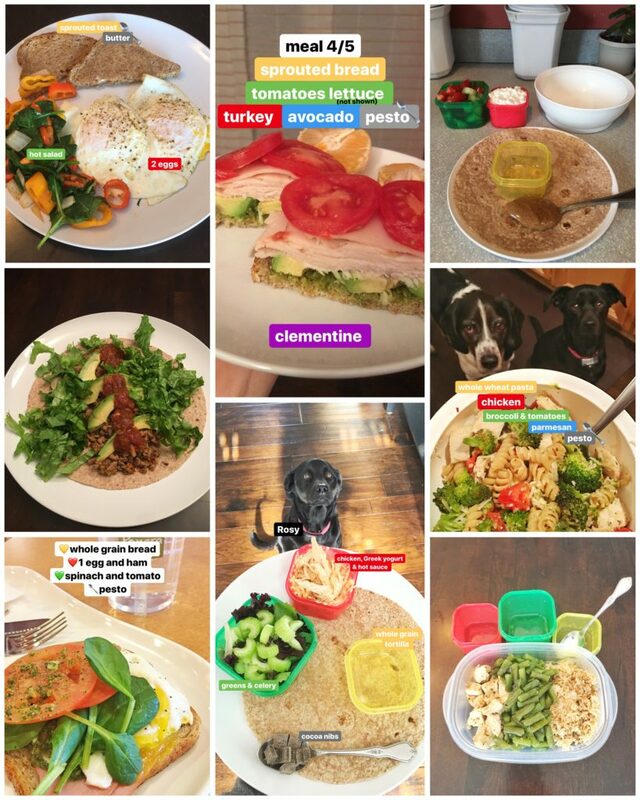 Want to see what I’m eating next week? Well first off let me tell you that we were told NOT to weigh ourselves during the first 2 weeks. I am a rule follower, so I didn’t. BUT, I can tell you that I feel tighter and toner and my clothes are fitting better already! I can tell I am less ‘mushy’ in the middle and I just feel stronger, walking taller and ready to push on for week 2! And even though I told those 51 ladies they shouldn’t weigh in until week 2, a few couldn’t resist, and I can’t blame them! I’m very excited to announce that I’ll be starting a WAVE 2 for anyone ready to jump in and get to work on a transformation of your own! If you are willing to do the work and trust the process, than I will help you stick with it and support you every step of the way! free access to this and any of my monthly groups forever!